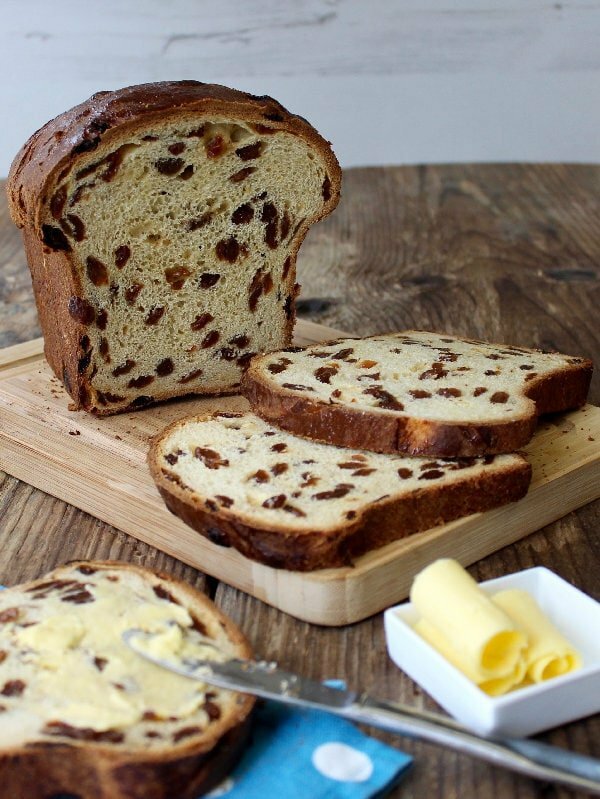 Guernsey Gâche (pronounced “Gosh”) is a traditional fruit loaf. The perfect teatime treat or toasted for breakfast. I’m a little late with my first post for 2016. Christmas holidays spent with our family in Guernsey have certainly whizzed by, even allowing for the additional days courtesy of prolonged storms. High winds, a six metre swell, a damaged ferry and three crossings cancelled certainly contributed to a memorable holiday. Even when we did manage to “escape” the Channel Islands during a lull in the weather, the sea was still on the rough side and I feel so lucky not to suffer from sea sickness. 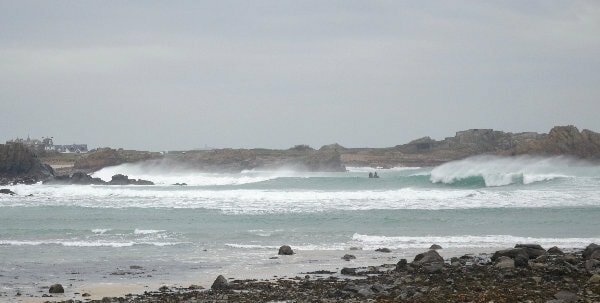 Whilst on Guernsey we managed to get plenty of beach walks, dodging the wettest of the weather on most occasions. My son and his wife thoroughly spoilt us with a delicious Christmas dinner and I really enjoyed having a rest from cooking on the big day – I was barred from the kitchen and I didn’t even do any of the dishes ! I don’t want to appear completely lazy though, so I would point out I made a nut roast and my Slow Cooker Onion Gravy on Christmas Eve to provide a vegetarian option for the next day. Each time I visit Guernsey I pick up a Guernsey Gâche (pronounced “Gosh”). 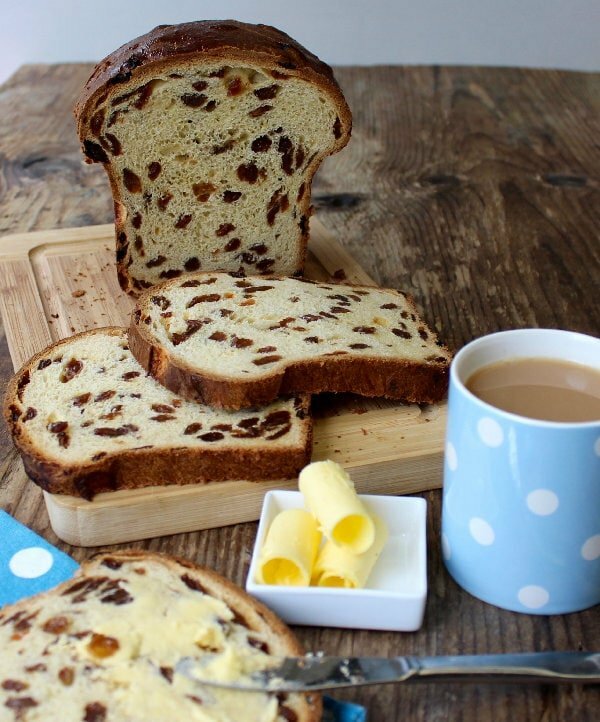 I love a slice of Gâche just as it is or toasted for breakfast, with plenty of Guernsey butter for an extra treat. 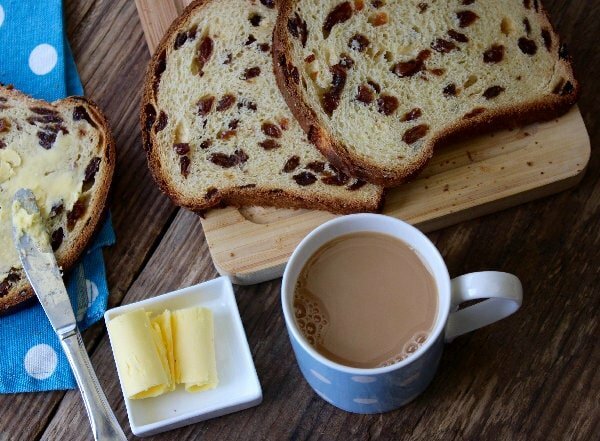 Gâche is a traditional tea bread made from an enriched yeast dough and plenty of dried fruit; Guernsey butter and milk is used to make this rich tea bread but a full fat milk and a good quality butter can be substituted. Gâche means cake in Guernesiais. We have so many fond memories of summers in Guernsey, particularly when our boys were young and we’d spend whole days on the island’s wonderful beaches; many a time our Guernsey friends and their children would join us as we “set up camp” for the day. More often than not, a feature of the day was tea from the beach cafe kiosk where real tea in a proper pot, along with cups and saucers, was available in a wooden basket to take onto the beach. A slice of Guernsey Gâche with local butter completed the late afternoon beachside teatime treat. Although the “Beach Baskets” are no longer available for afternoon tea, Guernsey Gâche remains a traditional local favourite. For this post, I’ve stuck to a traditional Gâche recipe as my Gâche Melée with a twist caused a bit of a stir with some traditionalists. To redress the balance a little come next apple season, my friend and home grown Guern has entrusted me with her mum’s recipe for Gache Melee so watch this space. In relation to traditonal and family recipes, Christmas day debate this year included whether or not it was acceptable to include carrots in a Bean Jar – I was relieved when the in-laws eventually concluded it was down to a matter of personal preference. Anyway, back to the Guernsey Gâche recipe. 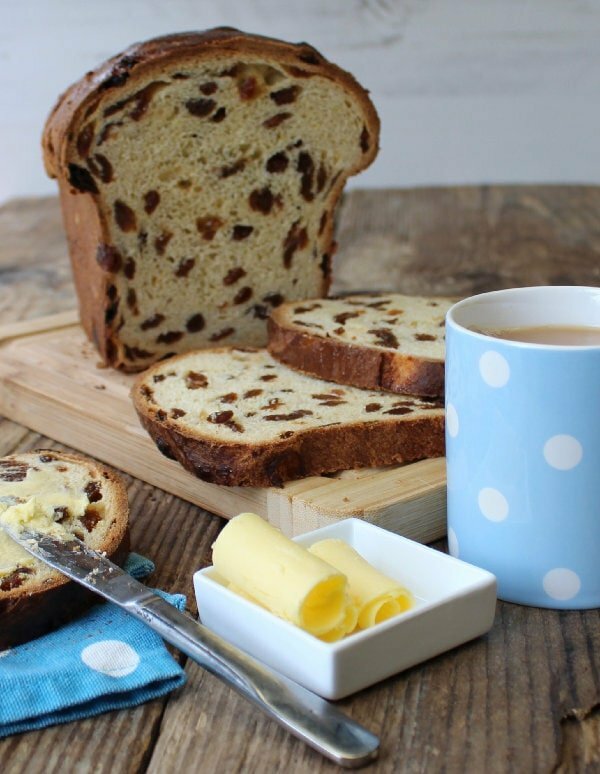 Guernsey Gâche (pronounced “Gosh”) is a traditional tea bread made with an enriched yeast dough and plenty of dried fruit. The perfect teatime treat. Combine all the dough ingredients except for the dried fruit in a large bowl, stirring them together until they form a ball. Knead by hand for 10 to 12 minutes before adding the fruit a little at a time until it is incorporated evenly into the dough. Add all the dough ingredients except for the fruit into your mixer bowl. Mix on slow speed number 1 for approximately 1 to 2 minutes then on speed number 2 for 8 to 10 minutes. Your dough should be lovely and smooth and elastic. On slow speed add the sultanas and mixed peel a little at a time until incorporated into the dough. Place the dough in a greased large bowl and cover with cling film/plastic wrap. Leave to rise in a warm place for 2 to 3 hours. Once the dough has doubled in size, knead lightly into a loaf shape and place into the tin. Cover with a clean tea towel and leave to rise until doubled in size – this should take approximately 1 to 1½ hours in a warm place. Bake in the oven for 50 to 60 minutes, after 30 minutes lower the temperature to 200°C for the remaining 20 to 30 minutes until golden brown. Remove from the oven and leave to cool in the tin for 15 minutes. Turn out onto a wire rack to fully cool. When you tap the base of the loaf with your fingers, it should sound hollow. Enjoy spread with butter, Guernsey butter if you can. To make a nice light loaf, shape the dough into a rectangle with your fingers or a rolling pin; the width of you dough rectangle should be the length of your tin. Roll up the dough and seal the ends and along the seam using your fingers. Place the dough 'seam side' down in your tin.To make a nice light loaf, shape the dough into a rectangle with your fingers or a rolling pin; the width of you dough rectangle should be the length of your tin. Roll up the dough and seal the ends and along the seam using your fingers. Place the dough 'seam side' down in your tin. The Teatime Treats Challenge hosted by Karen over at Lavender & Lovage and Janie at The Hedgecombers, hosted this month by Janie. 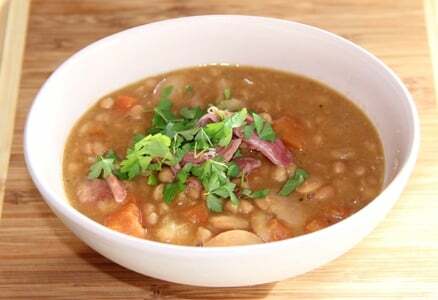 Charlotte’s Food Year Link Up Challenge over at Charlotte’s Lively Kitchen. And linking to: Fiesta Fridays co hosted this week by Sonal at Simply Vegetarian 777 and Petra at Food Eat Love. Born and bred in Alderney, now living in the uk and missing this delicious treat my mum used to make me, so decided to make some of my own! A bit of hunting and your recipe came up- easy to follow and smells just like mum’s! 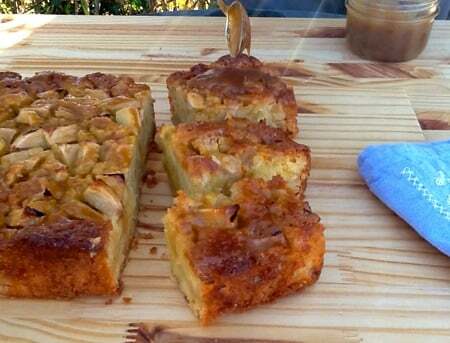 Hi Jo, glad to hear you found our blog and you enjoyed making Gache. Even better to hear it smells just like your Mum’s. I would love nothing more for breakfast than a slice of this fruit bread toasted with pastured butter. So beautiful, too! This reminds me of an Italian bread that I’ve been seeing around lately with the cake bosses face one it.. lol I can’t remember the name of it, but just that. I’ve been really wanting to try it for some reason, but I think this will do just perfectly, thanks! I love the aroma of freshly baked bread, especially when its still warm with a generous slathering of a good quality butter! mmm, I really look forward to trying this! Wow! I can’t get over those waves. I can see why the ferry would have been damaged. As for this bread. . .well. . .it looks absolutely delicious. Toast it with a pat of butter and it would make the perfect breakfast. Man… didn’t even know about this little island! Gâche sounds like a divine bread even off the holiday season I would have no problem eating eat all year long. Sounds like a nice recipe! Toast and tea or coffee is my kind of breakfast! Not only is this loaf beautiful, but it sounds delish too! This is my kind of bread. Perfect for breakfast with butter. Nothing beats the aroma of fresh baked bread. I always feel like I accomplished something when I make bread from scratch. I absolutely love fruit loaves, will have to pin this one for later. Thanks for sharing. Thanks for popping by Jay & a pleasure to share recipes. What a gorgeous place to spend the holidays! Even stormy the water is gorgeous! I wouldn’t have wanted to make the cross, and I hate that there was damage, but your photo is beautiful! And the bread is just as pretty, I love a fruit bread, I love it for a grilled cheese with swiss or just toasted with butter! Pinning the recipe, I need this bread in my life!!!! Thanks Nikki, Guernsey is a beautiful place to stay and I love watching the winter sea. So glad you like the Gâche and thanks for pinning. my mouth is watering, this looks amazing, but what has truly captured my heart is your talk of Guernsey, this is somewhere I have longed to visit for years since I first heard of it I have imagined being there. It is a long way from Australia though and not on the budget yet, but one day. I reckon flying is the best option at Christmas but we have a dog so we’re stuck with the ferry. It does take a bit of getting used to seeing the supermarket shelves bare, the vegetables that were available were looking a bit sorry for themselves so I’m not surprised you ate a lot of baked beans. Thanks for stopping by Emma, let me know how you get on. I am a bit jealous you have your own bread! 🙂 It looks positively delicous! And how did you get that butter to curl like that! Amazing! Thanks Mollie, I used a cheese slicer, the sort you can use to make chocolate curls, the Guernsey butter is lovely to work with. I feel I’ve just had an education in traditional Guernsey food, I’m clearly missing out on a while region in my food knowledge as I’d not heard of any of the things you mentioned. Based on this I think I could definitely get on board with traditional Guernsey fare as it sounds like just my sort of thing. My whole family like fruit bread so I’m definitely going to give this a try sometime. Sounds like a great place to get stranded due to weather! Your bread looks delicious and always with some good butter! Thanks Judi, it is a lovely place to get stranded. I love baking my own bread, that looks beautiful. I do love the addition of fruit in breads, I make Irish Soda Bread with dried fruits, it’s so delicious too. I have heard of Guernsey Gâche but I’ve not yet managed to try eating any. I think it looks like a delight. A perfect breakfast for me. Thanks Phil, you really must try some Guernsey Gâche, I enjoyed a slice toasted for breakfast today. Oh my Gâche 😉 Now this is my type of bread! Warm, fluffy, and filled with sweet raisins. Delicious! I wish I had some of that delicious Guernsey butter, but I am sure that bread is delicious with any butter at all. Thanks for sharing. Thanks Hilda, the butter has all gone I’m afraid but you’re right it’s delicious just as it is. This looks delicious, we all love fruit loaf in our family. Pinning and will definitely try. 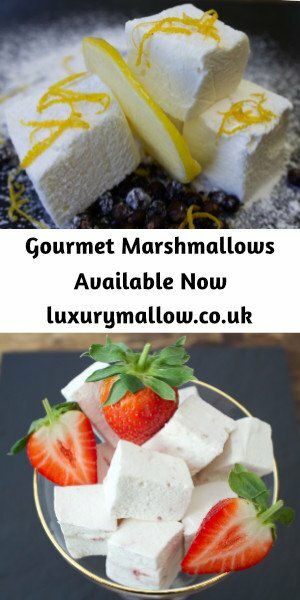 You have some really lovely recipes on your site, so have been on a bit of a pinning spree! Thanks for your kind comment Sarah, so pleased to meet you through #BloggerClubUK I love your craft projects & I’m looking forward to your foraging posts. This bread would be a real treat for breakfast. I just love all of the goodies in it. Your curled butter is perfect! I don’t think I would ever get a curl like that. It’s wonderful spending time with our family over the Holidays. Glad you got to do the same. Thanks Julie, the butter curl is easier to make than it looks, I used a cheese slicer, the kind you use for chocolate curls. Absolutely loved the Goch!! The recipe explained is absolutely fantatsic. The memories shared of the beach vacation are priceless! Thanks for bringing it to FF 103 :). Have fun! !